Celebrity chef Ching He Huang is backing the UK’s first dedicated Chinese Culinary Arts diploma aimed at tackling the shortage of chefs in the industry. Ching, who attended the diploma’s official Founders Day launch at Crawley College and who has seen a scholarship named after her, claimed ‘the future for Chinese cuisine in the UK just got a whole lot brighter’. This month’s Founders Day event was an opportunity to showcase the course and the skills of Chinese cuisine but to also raise further awareness of the issue facing the Chinese restaurant industry, which is having to recruit from overseas at great expense. This course, backed by the Chinese Cuisine Association and Tianjin Food Group and run by PAM Education and the college, is aimed at producing home-grown chefs skilled in the art of serving up exemplary Chinese cuisine. 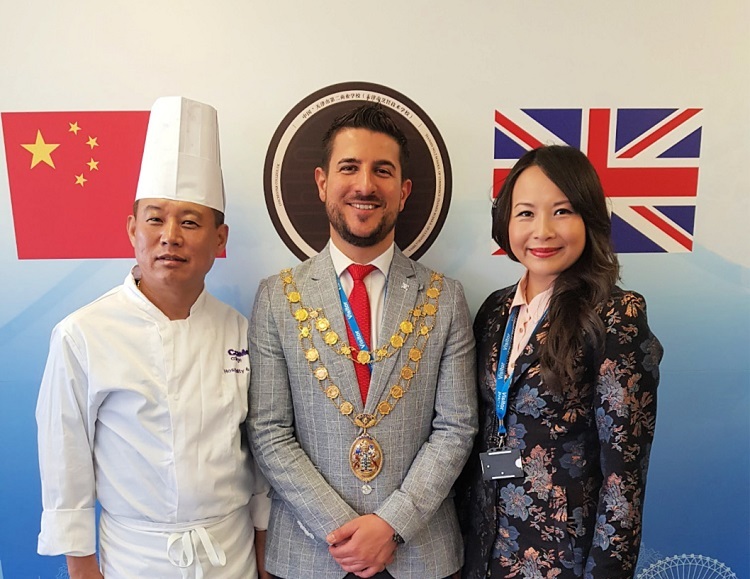 The launch day, which was also attended by Cllr Carlos Castro, the Mayor of Crawley, included a demonstration of the food skills to be taught on the course, a live link to the Tianjin Training School and a tour of the facilities including the purpose-built kitchen. Ching sang the praises of the launch and highlighted the course on her Instagram profile. She said: “A momentous day to help launch the first ever Chinese Culinary Arts qualification for those wishing to study Chinese Cookery. The future for Chinese cuisine in the UK just got a whole lot brighter. “A great Sino-British initiative part of China’s One Belt One Road Programme. This much needed investment is required to bridge the skills shortage in Chinese restaurant industry. I was so very honoured to be a part of this. PAM director Russell Grocott added: “Founders Day provided a fantastic snap shot of the positive impact this course can bring to the industry both in the UK and Internationally.